Let me introduce you to my new favorite: the gauntlet. Oh, how do I love these. 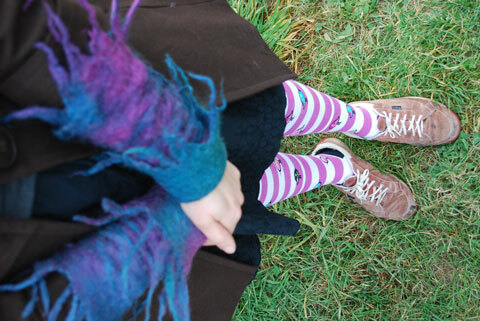 They are soft, colorful, warm and so interesting to twiddle when my patience threatens to wear thin. Time for lunch? Flip up the cuffs. If you were to follow me around for a few days, you might suspect that I wear the gauntlets simply for the fun of playing with them. 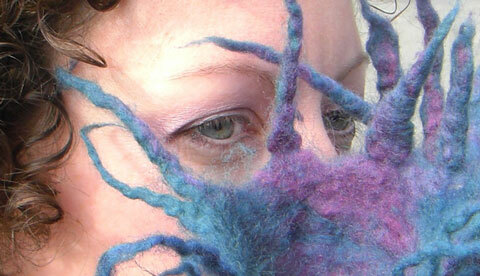 I tickle my nose and my lip; I twist the fiber; I get lost in the color patterning. They are more than clothing, they have become a toy. This picture appeared to me in a dream the night before teaching a class using resists. Thanks to Inger for fielding my questions on her methods. 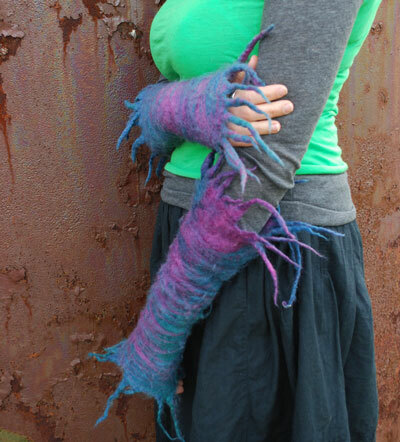 I have admired from afar her wrist warmers, but hesitated to try them for myself because I didn’t think the felt would be snug enough around my wrist if it was wide enough for my fist. Her reassurance gave me the confidence to try. Have faith, the felt will stretch and give enough for your hand to fit. Speaking of toys, I have finally bought myself a new camera, a Nikon D60 and a fantastic tripod capable of defying the normal laws of gravity. When the salesperson demonstrated the cantilevering abilities of the center support, I knew this was the tool for me. Oh, how I have longed for a camera that has the ability to blur backgrounds. I dream of depth of field like some dream of skiing through fresh powder. Seems silly when I put it in writing, but there you go. I expect this may just the tool to get me back into blogging again. It may also earn me a swift bonk in the head from my closest acquaintances. PS. Scythian is a great foot-stomping, blood-pumping, make-you-jump-up-and-down Celtic band we heard this weekend at Wintergrass. The word reminds me of something rising from the depths of the unknown; when I wear the gauntlets, I often feel as if I were a sea spirit emerging from the murky water. Hopefully that is sufficient rationale for the name. This entry was posted in felt, felting by Leah. Bookmark the permalink. Congratulations on the successful gauntlets! They’re gorgeous and I would have had the same worries as you. And congratulations on making me drool, I hope to have the same depth of field as you… someday I will! I know days when I don’t feel like blogging, my camera does it for me, I wish many days of creative inspiration for you! Oh those are frakkin fab!! Those are too fabulous for words. Just love these gauntlets!! 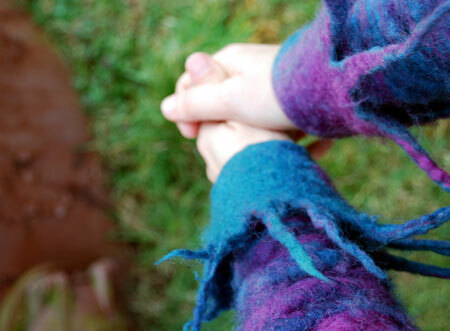 also the other wonderful felt pieces on your blog. GORGEOUS! Any tips on making a pair for myself?